I know that you too are ill and having jammies days. The good news is that with three days off work and then a half days worked before this weekend I am beginning to feel better myself so I hope the wellness is spreading over the Atlantic. I have been re- taught the lesson I keep being taught and then promptly forgetting,i.e. that rest and relaxation is not simply a waste of time. I feel I have so little time for creativity compared with all I want to do and learn that I must cram it into every hour. Which works really well until my body stops working and refuses to sit upright never mind walk up all the stairs to the studio. 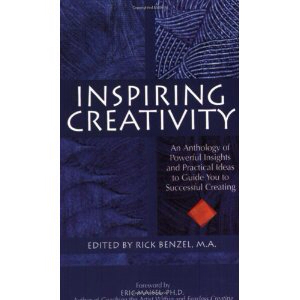 I did manage to read a little of a book called Inspiring Creativity, which is an anthology of essays by creatve coaches and a couple of things resonated. First the concept of rituals to begin creativity sessions. I had been following a number of articles and web links about that very topic about the time we started this blog so rather than harp on too much I'll give you like links below. I am still mulling over how to apply the concept... I am far too careless for candles in a studio I think! But I am thinking about rituals I can create focusing on clearing my head ready to concentrate on creativity. At this time of year I like to take stock and plan. I would not say I make New Year Resolutions as such but I tend to review the past year and contemplate how i'd like the New Year to be and what I need to to to achieve those goals. Such an approach of course works far better if you actually review those goals from time to time before the year is over. the SAQA visioning project works well for me in that respect. But I thought this coming year I would combine the ritual with the relaxation and the planning and the clear heads. I have made appointments in my diary for the first Saturday morning of each month under the heading Reflection Morning. I plan to start with yoga at home, go to my local beautician for a massage or pedicure and then to Cafe Boc Boc with a journal for tea and cake and a rumination session. On My Own. That I think will be the essential part don't you think?! that seemed like a good ritual. The other thing I read in the book which caught my attention was about statements of intent. Always start with a clear intent of what it is that you want to achieve with a painting. When a painting fails,very often it is because there are too many differing or conflicting objectives included at once, or alternatively there was no good reason to paint it at all. I cannot see how it is possible to paint anything unless you know why you are painting it and what your aims are.It is only with that vision for the painting that you can judge which medium will work best and similarly address all the other considerations that play a part in creating the right effects and impacts. For me it is crucial to have a clear objective for a painting. When I first read it I noticed the phrase " when a painting fails". I always find it difficult to understand how you can say that a painting or a quilt 'works'. I mean at a basic level, if the three layers stay together it is a quilt and it works. Beyond that is seems a rather subjective and undefinable concept. But, then I thought some more and realised that, yes it is a subjective thing, but it is up to me to define what I want that work to do. It might be just that I want something finished and no more. Or that I want to improve my grasp of a technique or to impart a message. Whatever it is, if I do not have a clear idea of what I am doing at the beginning how can I decide if I did a good job? i know that sounds oh so obvious but It dawned on me that it is a good tool to help me recover from the 'not good enough, again' malaise with which I tend to suffer. I need to formulate a statement of intent but that needs to be both challenging and achievable. I tend to fall between two stools. On the one hand I take a realstic approach in relation to time available and aim for just meeting a deadline I always achieve that. but so often I am disatisfied with what I do which is because 'Produced' is a meagre intent and gives me a temporal rather than artistic goal. On the other hand whilst I say ( to myself and to others) that I am aiming just to particpate or just to finish, what I really intend, without actually admitting it ( to myself or to others) is that I want to produce a work of art equal in my eyes to those done by the artists I admire. Those would be the full time, professional artists with years more experience than I have and who often have formal art training. And so I feel that I spend my time dilligently finishing examples of mediocrity. And thus, I set myself up to fail even as I succeed in a way that leaves me empty. So from now on I am going to set a statement of intent for each piece which is higher than Finished, lower than Gobsmackingly Perfect. And that statement of intent will be as much about learning and improving and producing as it will about achieving. Because if I am for a particular thing and feel I did not meet it, I will not have failed, I will have learned what not to do and then I can set my statement of intent for the next piece to be to apply that knowledge and get over that hurdle. I think that that is the most I can expect of myself because I will always want to improve. I drive Dennis mad. We have a newly renovated house which needs art work. I want to acquire pieces bit by bit direct from artists as I see something which speaks to me and as we can afford it. Dennis is puzzled by the need to buy work from other people when I can make art. Everytime I make a piece he asks if we can please put this one up on the wall. The answer is always no. I don't want to spoil my new house with mediocrity all over the walls. This despite the fact that this piece is destined for the hall. We invested in several works by this artist in the old house and this one never made it onto a wall for lack of space. Now, I like this work. I like the clarity and I like the message. I am not phased at all by the fact that is is, literally,a finger painting, because the message behind it is powerful and outweighs the simplicty of the construction. 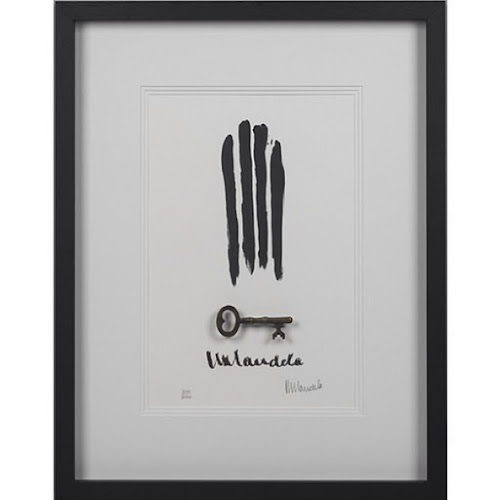 It is is Nelson Mandela's representation of the bars of his cell window and the key is a replica to his cell. The Great Man himself dragged paint with his fingers and then left well alone. Save to put his signature on it. But if I had done it? Too simplistic. Not skilled enough. A bit if a cop out. Not worth sending to a show or gallery. I would love to know if Mr Mandela wanted to throw this in the bin and was persuaded not to or whether he had the self acceptance I lack. Of course, I suspect he could sign a used tissue and it would sell! Do you suffer from all this internal criticism and self analysis, or do I just need to get my head out of my backside, stop making a deal out of things and just make some flippin' quilts?! Not that those two options are necessarily mutually exclusive! Oh, in your last post you talked about seven words to describe what you wanted your quilts to be. Did you formulate your list? I found it harder that I thought but this is my draft list... I am not quite ready to consider it finished yet!! Ok, this post has taken far too long to get to you so I shall leave it be now. Do you take your creative rituals seriously enough? Maybe you might like to try out these criteria to tighten up on your goals for your quilts. If you're interesting there are lots of good articles explaining SMART on the web. Hope it might be of some help. Helen, you have a wonderful way of explaining and writing about your self doubt, and your sense of humour about the whole thing is exhilerating. IMHO, I don't think yu have anything to be doubtful about. I have seen the art that you create and I can only wish that someday I can emulate your creativity and enthusiasm in my art the way you do. As for wht you would like your quilts to be, I think that is a good list.